You can find new or used RV sales at wonderful savings whether you are a first time buyer or a long-time RV owner. You just need to look in the right place. At PedataRVCenter.com you will find all of the resources you need to buy, trade, and/or sell your motor home. They have information on every aspect of motor home buying, selling and ownership so that when you are ready to purchase that fifth wheel, motor home, or diesel pusher you have all of the knowledge that you will need to feel confident about your new recreational vehicle. This is RV sales at its finest. Before you even set foot on the lot at a motor home dealership there are things that you can do to be better informed and prepared. Visit our rv inventory and you will find information about the different types of recreational vehicles. You can learn the difference between a travel trailer and a fifth wheel, and what the advantages of a diesel pusher are over a gas-powered motor coach. You will also find RV sales information about the new and pre-owned top-of-the-line motor homes that we offer. Financing is a big concern for many motor home buyers whether they are first-time buyers or experienced motor home owners. They want to get the best RV sales price on the best product that will fit their lifestyle. If they have a trade, they want to make sure that they get fair market value for it. An online motor home loan calculator can help you to determine what you can afford for a monthly payment. You simply enter the price of the motor home that you would like to purchase, the length of financing, and the interest rate and within minutes you will have an estimate of your monthly payment. These RV sales can also be made easier by getting pre-approved for your RV loan. 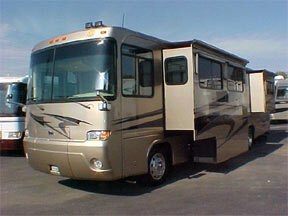 There are many types of loan products that are designed specifically for new and used RV sales. They have flexible financing terms to meet every budget and lifestyle. Pre-approval gives you more leverage when you are buying because you know exactly how much you can afford. Choosing a dealer is almost as important as choosing a motor home. Pedata offers the entire brand new Holiday Rambler RV line at wholesale prices, saving you thousands of dollars, along with a wide selection of quality pre-owned recreational vehicles from the top motor home manufacturers. You can check out their RV sales online, buy an RV, arrange travel to the dealership, or even have your new motor home delivered to your home. The whole process has never been easier. 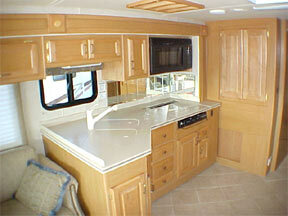 Yet another important aspect of RV sales is the service after the sale. A dealer should offer an extended warranty for any new or used recreational vehicle that they sell. Our site also offers links to clubs for RV owners and information about the best places to camp and stay along with other RV travel tips not just RV sales. It benefits the buyer and the seller to maintain these relationships after the sale. A motor home can change your life and your lifestyle for the better. People and families of all ages, sizes and backgrounds are discovering the joys of motor home ownership. They enjoy the freedom that it gives them. They don’t have to make hotel or plane reservations. They can have a “home-cooked” meal out on the road. They can travel in comfort with all of the necessities while they are out camping or traveling cross-country. It can bring families and friends closer together and make memories to last a lifetime. A motor home can get you on the road to adventure.